I am giving you my coveted pumpkin pie recipes. 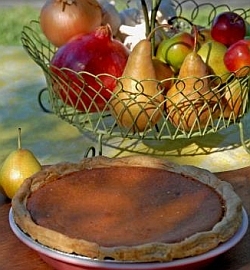 My fresh pumpkin pie from scratch is the most requested pumpkin pie and if I were you, I would make two at a time. I make this year-round and store it in the refrigerator, so in the summer it is still a cool, refreshing dessert. Topped with my flavored whipped cream - it's heaven on a fork. Treat your family with this pie, and maybe they'll treat you by cleaning the house (I know, but I tried). 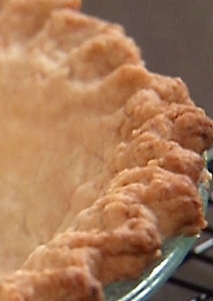 Meanwhile, make your pie crust (recipe below) and place in the pie plate. Mix 1-1/2 cups fresh pumpkin with remaining ingredients. Pour into the prepared pie shell. Bake 15 minutes at 425 degrees, then reduce heat to 350 degrees. Bake another 45 minutes or until an inserted knife comes out clean. 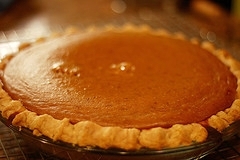 There is nothing that can beat this fresh pumpkin pie recipe. Here's how to make your own pumpkin puree. Use this instead of canned pumpkin. Purchase small to medium size sugar or pie pumpkins. Clean and slice meat from the rind. 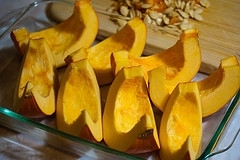 Cut pumpkin into squares and bake in a covered (or larger) dish. Bake for 25 to 30 minutes or until pumpkin is very tender. Remove and put immediately into a blender and make puree. For a no-bake pie (such as my favorite; fresh strawberry pie), bake at 400 degrees for about 10 minutes. For a pie which isn't as sweet, I would also recommend adding 1 tablespoon of sugar to the flour. This old fashioned pumpkin pie recipe produces a light, fluffy pumpkin dessert that is outstanding. Blend gelatin, brown sugar, salt, spices, pumpkin, egg yolks and milk in a saucepan. Cook over medium heat, stirring constantly until mixture boils. Place pan in cold water; cool until mixture mounds slightly when dropped from a spoon. Beat the egg whites with cream of tartar and white sugar. Beat until stiff peaks form. Gently fold the cooled pie mixture in with these egg whites. No stirring. Pour into cooled crust. Chill until set; approximately 2 hours. Garnish with whipped cream and 1/3 cup of toasted coconut, if desired. Mix together and store in a container with a tight fitting lid. In a bowl, beat egg whites until foamy. In a mixing bowl, combine all ingredients except the egg whites. Beat mixture for one minute. Gently fold in the egg whites and pour into shell. Bake for 10 minutes and reduce heat to 350 degrees. Bake an additional 30 more minutes or until a toothpick inserted in the center comes out clean. Combine pumpkin, brown sugar, molasses, spices and salt. Add eggs, scalded half-and-half and rum. Brush unbaked pie crust with beaten egg and refrigerate for 10 minutes before adding the filling. 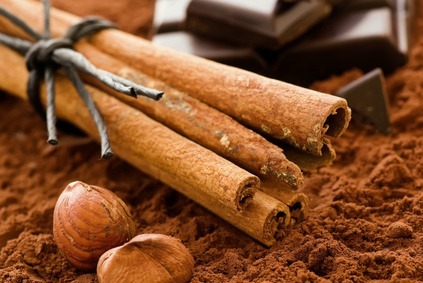 Bake for 45 minutes or until mixture does not adhere to a knife blade or toothpick. Serve with bourbon flavored whipped cream.